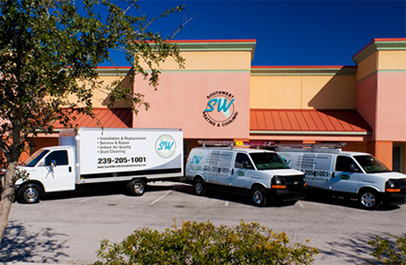 Southwest Heating and Cooling, Inc. is a family owned and operated Air Conditioning Company located in Cape Coral, Florida. The owner, Jason Dunn, was raised in Cape Coral and has lived in Lee County most of his life. His staff has over 25 years combined experience in the air conditioning business and they are some of the most knowledgeable in Southwest Florida. Friendly & knowledgeable technicians with your comfort being their foremost responsibility. The highest quality and most energy efficient air conditioning products. Timely service when you need it. Thank you for considering Southwest Heating and Cooling Inc. for your air conditioning needs. Copyrights © 2019 Southwest Heating & Cooling All rights reserved.